Is it me or is volume 3 not touching anything? oop. i was moving a whole bunch of stuff around and forgot to move the wire. layout's been fixed and updated. BTW it's 8x10, not 9x10. And I made mine 8x9 anyway. Fits easily into a 1590A. Thanks so much for the layout! Sounds great with my Strat. In the description it mentions silicon transistors as an option. Any idea which ones they used? i'm not sure of the ones used in the Si version, but you can sub in any NPN Si transistor. It took some searching, but I found out they use the NTE123A as the silicon option... be sure to bias your transistors properly by adjusting the 33k and 8.2k resistors. that makes a huge difference actually. it affects the output level and bias of Q2. yes, i know. it's just funny that it's "based on a fuzz face" but it's just a one-part difference. well, if you really sit down and think about it, 99% of the pedals out there really are just a few tweaked designs, ie 1 or more values changed or different transistor/ic. prime example is the venerable electra distortion. lovetone has made a mint on selling what is essentially the electra distortion with a few changes. or how many OD's that are basically tubescreamers, which is why so many reverse engineered pedals are simply YATS (yet another tubescreamer). One of the best Fuzz Face I hear, sounds a lot like Eric Johnson. You don't have to use NTE103 transistors. You can use any NPN Germanium transistors. Building pedals isn't always about it being cheaper then buying the real thing. BC109,s for me. Bit of doomy fun! I hate to be a smart alec but that top cut doesn't need to be there. Correct i noticed that as well. I tried your suggestion Moda and it sounded pretty good. Right now i have a pair of BC550Cs in one and it sounds really good too. I don't know why, but this FF circuit has worked out better for me than most others I have built. Hi Hamish. Whacked some 550,s in. Not bad. They tighten it up a bit to my ears. I've just built this and it sounds great with a BC107 and BC108 but when I roll the guitar volume completely off I get an awful ticking/humming noise. Does anyone know what this is and how to cure it? 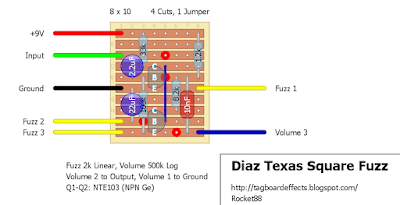 I play a lot on the guitar volume so don't want to have to keep turning the pedal on and off when playing live. Sounds like DC ripple/hum. You should add 100µ or 220µ + 100p caps from supply rail to ground to act as power filtering. Or you could power it with a battery or a well regulated power supply. Thanks Miro. I had a feeling it was something like that. I will give it a try when I get home. Also got an OCD clone that I've just built and all of a sudden it has lost volume. Unity used to be around 9oclock and now it is around 2oclock. Could this be a dodgy pot or cap? Built this with 2-BC550c transistors and it sounds phenomenal. 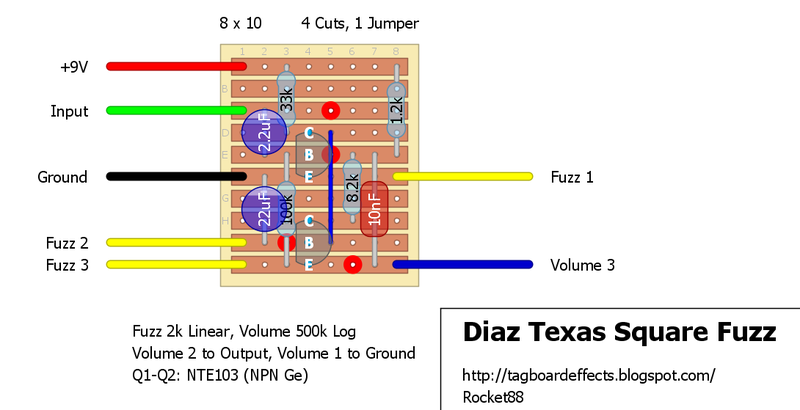 Does unplugging the guitar from the input turn the power off on this build? In order to preserve battery?